Tough times for the Tech Union. The main story explores the potential impact of the Labour government's nationwide price freeze on Union subscriptions. Fears are the freeze could result in at £10,000 deficit in funding, which could lead to closure of the new £450,000 Tech Union building. 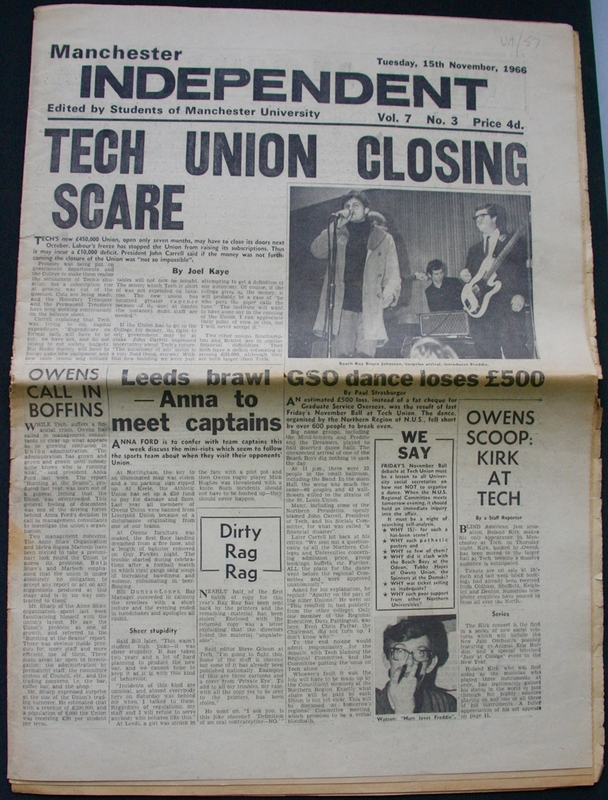 The November Ball at the Tech (featuring the Mindbenders, St Louis Union, Freddie and the Dreamers and a surprise appearance from Beach Boy Bruce Johnston) is also described here as a 'debacle' due to the fact that it made a loss of £500. '60 couples and 42 wallflowers wilted to the strains of the St Louis Union', the piece states. Why 15/ for such a has-been scene? Why did it clash with the Beach Boys at the Odeon, Tubby Hayes at Owens Union [MDH] and the Spinners at the Domski? In happier news, jazzer Roland Kirk's gig has been moved from Owens Union (Academy 2) to the Tech's bigger hall.